ST. GEORGE – Matt Clark, a well-known Southern Utah artist, has won the prestigious Sears Dixie Invitational Viewers’ Choice Award, and his work is appearing at the Sears Art Museum Gallery at the Dolores Doré’ Eccles Fine Arts Center on the Dixie State University campus, 225 S. University Avenue in St. George. 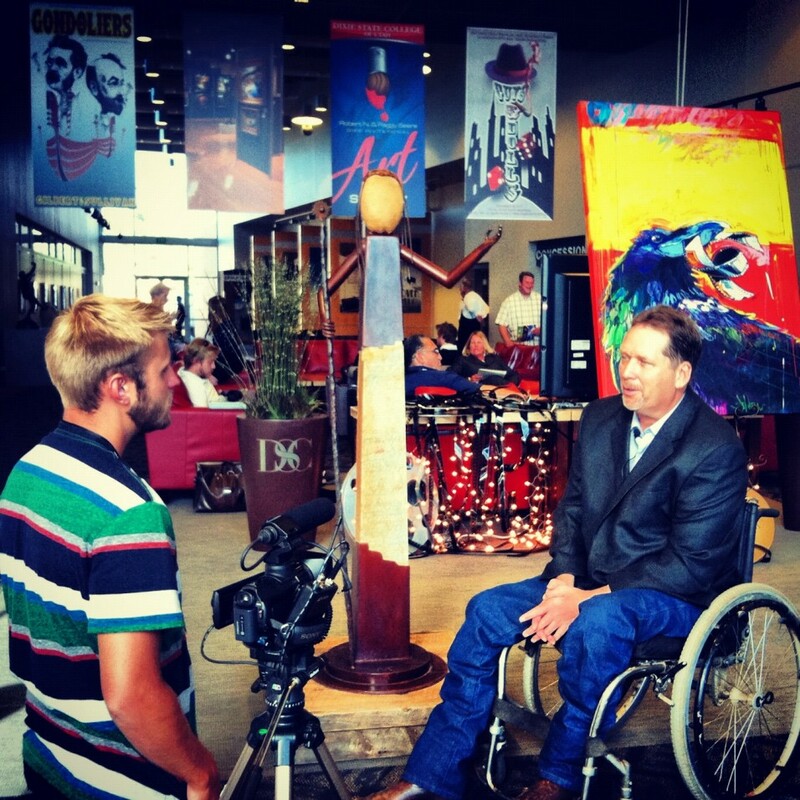 Clark’s winning piece, “Big Red,” is an original life-sized sculpture based on his beloved rodeo horse of the same name, who stood 17-hands high. See Clark comment from his studio in the video top of this story. As a child and teenager, Clark dreamed of becoming a world champion cowboy, but, at age 17, he experienced a serious spinal cord injury. After more than two months in the intensive care unit and six months in spinal rehabilitation, the doctors dismissed Clark to a rest home and gave him three years to live. Clark still works from a wheelchair more than 36 years later. His physical limitations have required him to create his own tools and processes for doing things, but his accident has also given him the opportunity to recreate himself and his world. My body has been broken and may not heal, but my spirit can and will transcend my limitations. The metal objects used in Clark’s art were originally created to perform a specific function. At some point, they outlived their usefulness, were broken, and lost their value. He surrounds himself with them and asks the question, “What is the best purpose for this object?” He searches for each piece’s innate power and then resurrects it and gives it a new reason to exist. For Clark, the transformation of these objects is symbolic of his own journey, of ultimately transcending broken dreams and heartache. His artistic process is a reenactment of his life journey. “I think that has power in people’s lives,” Clark said. In just such a way, “Big Red” was given life when Clark placed a metal heart in its chest. 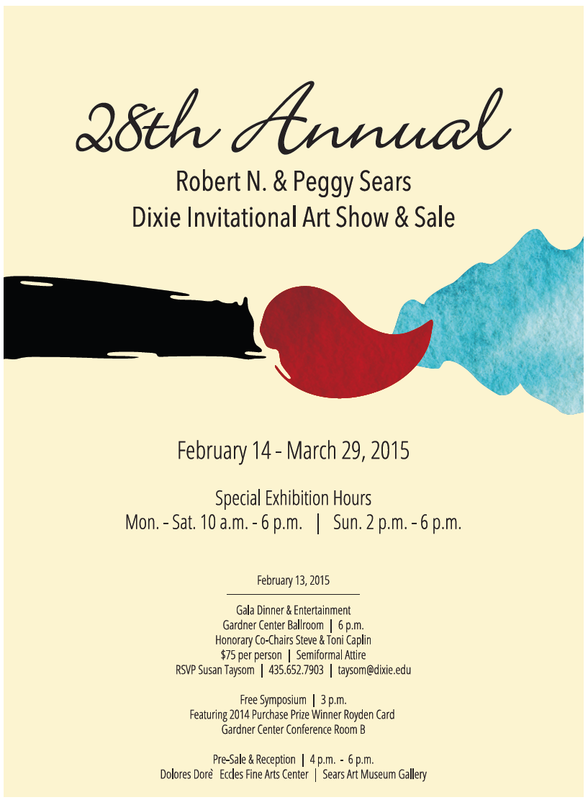 The Dixie Sears Invitational Art Show and Sale has been a mainstay at DSU for 28 years. Featured are 235 works of art from 120 renowned artists from Utah and the United States. Award categories for the show include oils, watercolors, pastels and other media, including bronze and ceramic pieces. The works are for sale and 35 percent of the proceeds are donated to the Sears Art Museum Gallery. The exhibit is on display through March 29. Special hours are Monday through Saturday, 10 a.m.-6p.m. and Sunday, 2-6 p.m. When: Through March 29, Monday through Saturday, 10 a.m. to 6 p.m. and Sunday, 2-6 p.m.